Manufacturing enterprises face numerous risks that must be effectively addressed in nearly every phase of their operations. Many of these risks are traditionally addressed via improvements within the planning processes, sourcing and the actual manufacturing execution processes. One area that offers great opportunity for mitigation in this regard is the selling process. In many ways, risk determines value. Enterprises that effectively address high-risk issues are rewarded financially by grateful buyers. Sales is uniquely positioned to address many forms of risk that directly impact the customer, and it’s based on the development and exploitation of a mutually beneficial one-on-one relationship with the buyer. This relationship is specifically developed to obtain an accurate understanding of the customer’s needs and to address those needs. This goal of the selling process is fulfilled through the sale of a product, the delivery of a service or the sharing of knowledge as each case may dictate. Let’s take a look at four specific areas where Sales can make a difference in mitigating manufacturing risks. Manufacturing is all about making things. Manufacturers strive to make things quickly and at the lowest possible cost. But, as important as manufacturing efficiency is, the product being produced must also offer value or usefulness to potential buyers. It does not matter if you are a process or discrete manufacturer or if your shop is make to order, make to stock or if you are a contract manufacturer; you will fail if buyers don’t buy your product. Manufacturers understand this concept very well. The whole theory behind the evolution of demand-driven manufacturing is based on the idea that nothing is built until there is proven demand for the product. That can be defined as market demand or as demand based on a single order. For Sales, this means being in close communication with the prospect. After all, the prospect and Sales ultimately share a common view of the prospect’s needs and the product solution proposed. When this is accomplished, Sales has brought assurance to their enterprise that the customer will indeed embrace and value the manufactured product. This process is greatly enhanced through the utilization of several technological assets available today. The online presence of the manufacturing enterprise is greatly enhanced through the use of customer or prospect portals. These sites offer a wide range of materials to educate prospects that are seeking information about their pains and problems as well as about possible solutions and alternatives available to them. Lead scoring and other online behavior evaluations provide useful data to the enterprise for purposes of qualifying potential buyers. Data processed through CRM software can drive product improvement or new product development strategies. For Sales, it provides a tool to track individual visitors in terms of matching up specific solutions with specific needs. After a specific level of activity is tracked, CRM signals Sales that a lead is developing, and contact can be made to affect a more detailed discussion of needs and solutions. 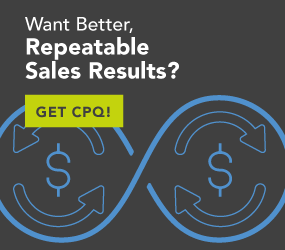 As the sales conversation evolves, CPQ software can facilitate a guided-selling approach that uses specific buyer input to drive configuration and option selections for products being considered. The final result is a product that perfectly meets the customer’s needs and perfectly fulfills their requirements. Sales has ensured that the product to be manufactured is efficacious. This reduces the risk of return and the expensive risk of having to provide a replacement product. The term product is defined beyond the limits of physical specifications and color. Manufacturers have to meet other customer requirements such as packaging, delivery dates and installation parameters. These special requirements can impact processes upstream in the supply chain and downstream in the logistical or delivery process. When Sales is asked to make a promise, they must be able to quickly evaluate if that promise can be made. Are inventory levels adequate to meet the demands of a large order? Can the product be safely transported in an open vehicle during freezing rain? Can delivery be completed during the graveyard shift? Manufacturers have a number of tools available to facilitate these needs. Supply chain management systems offer increased visibility into upstream supplier operations that inform decisions regarding part and supply availability and onsite inventory levels. These systems are useful in determining the ability to meet specific delivery dates by including capacity data to facilitate the planning and scheduling of future jobs. These systems may be standalone, or the functionality may be native to the ERP system used by the enterprise. At the point of sale, CPQ systems driven by Sales and customer input can interrogate inventory management systems, supplier networks, production scheduling systems and logistical systems to ensure that the special conditions a customer might request can be met. Manufacturers strive for quality in terms of management processes, execution and also quality in the product produced. Quality is more than just making sure all the pieces are in the box. Product quality means that the customer’s full expectations are met or exceeded. Sales really has a central role in making this happen since they serve as the primary interface between buyer and seller during the end sales process. It is up to Sales to gather and accurately communicate the customer’s expectations to the enterprise. This is the overarching goal from the time Sales first makes customer contact to the point where the product is accepted and turned over to the customer. CPQ again is essential to making sure the product configured and ordered matches the customer’s needs and requirements. As the customer and Sales discuss needs and options, the scripted interviewing process within CPQ guides the conversation with response-driven option selections. The end-product emerges from the configurator in both a descriptive form as well as in a three-dimensional virtual form. The customer can actually “see what they are getting” in terms of the delivered product. For the sales rep, this means that a fully specified, accurately priced product is defined in terms of line-item part pricing and a multilevel bill of material. This information is transmitted into the order-entry system that eliminates entry errors. Promise dates are kept because the inventory, supply chain and production scheduling systems all communicate with the order-entry process both in terms of CPQ and the host order management system. Clean orders mean error-free products and reduced factory returns. Any product built by a manufacturer has to be built within the cost constraints driven by the market and as defined by the financial limits of the manufacturer and customer. A solution that costs more than the pain it relieves is not a solution. All manufacturers seek ways to reduce product-associated costs and also improve their own financial performance in terms of margin. Sales has a role in the cost-reduction effort and can be selective about what opportunities are developed and what opportunities are passed by. Some sales opportunities may be attractive, but other realities may signal difficulties down the road even after the sale is complete. Customers with a poor credit history, that engage in litigious action over minor issues, have high turnover in the executive suite or are involved in ownership changes may result in a buyer/seller relationship that is less than advantageous to the seller. Sales reps and Sales management can gather this type of intelligence through a variety of services including Hoovers/D&B or Lexis/Nexis. Sales can also reduce costs by correctly timing their engagement with prospects. The ability to properly access online behaviors in terms of access to the seller’s website or portal and interpreting those online activities to discern tire kickers from buyers is important. Marketing automation systems and CRM provide significant functionality in this area. When contact with the customer finally takes place, the customer should be ready to speak with a salesperson, and the salesperson should be focused on what that customer needs to address their requirements and mitigate their issues. This precludes weeks of telephone tag, endless emails and physical cold calls to the customer’s place of business. These guided-selling processes should greatly reduce the interval between first contact and closing the deal. This means a lower cost of sale and higher margins after the sale. Sales spends its time making sales rather than chasing down contacts that have little interest in talking with them. Sales cannot operate effectively within a silo. Sales must be brought to the table along with IT, Operations, Finance and Product Management as a full partner in the execution of the business processes driving the enterprise. Sales can provide valuable input to product management and engineering regarding customer needs. This may be useful in the context of improving existing products and also in the process of developing new products. They can also provide an early warning to product management of any issues found with installed products. Heading off product recalls by addressing issues early is preferable rather than waiting until a crisis develops within the install base. This may also be effective in terms of finding upselling and cross-sales opportunities. Finance can help Sales with the issues related to ROI for some types of product evaluation cycles, and they can provide Sales with credit options and other alternatives to actually selling a product. Lease and rental options handled through Finance can expand the range of qualified customers available. Contacts with modest expense approvals may be able to authorize a lease payment for a product in lieu of a purchase transaction featuring a large cash outlay. Sales should work with IT to make sure their needs are being met with proper support and maintenance for sales systems used by the enterprise. Specific features available within digital products may or may not be properly activated and supported. Sales should develop a teamwork approach to working with IT to ensure that products they are using are delivering maximum effective functionality. IT can work with suppliers to ensure that needed functionality is current, active and properly utilized. Most operations managers rely to some degree on lean methodologies to create efficient processes in the production facility and in the operation as a whole. Sales is part of this process by ensuring that orders submitted are error-free and accurate. Sales can also work with operations to handle special requests from the customer related to product configuration, part sourcing and other requirements. When the organization is focused on delivering excellence to the customer, teamwork is required to make that happen. Sales is part of that delivery team—a very important part of that team. Enterprises that deliver excellence to their customers, embrace the customer as a partner and key their own success on the success of the customer will find that the level of risk encountered is mitigated by the very processes that build and maintain that success-based relationship. Risk is a part of doing business. In many ways, risk determines value. Enterprises that effectively address high-risk issues are rewarded financially by grateful buyers. Sales is an essential part of the risk-mitigation solution for manufacturers.